I have been on a mission lately. Within the next year I would like to buy a plot of land, (a little slice of heaven I will call Harley farms) to grow vegetables and raise chickens. I know I may sound like I am loosing my marbles, but I have a great desire to put my hands in the ground and contribute to what I put on my plate. Evidence of this journey has been shown in this post, gardening-getting back to basics and here DIY-container gardens. And word on the street, it’s rewarding! On my journey to getting back to basics, I have been knee deep in research. I am a designer for heavens sake, not a farmer. If the world were to end tomorrow I can give you one hell of good-looking tent, but don’t count on me to grow tomatoes, at least not yet. But don’t give up hope! I am a survivor, and if nothing else I’m a good communicator so we can at least talk someone else out of their tomatoes! On today’s journey we are going to talk chicken coups. From what I have read, it seems that BantamBrahmas are a favorite type bird. For practical people who just want a basket of fresh eggs, opt for Red stars or Rhode island reds. Leghorns are popular in the Tennessee area and if you want fancy Martha Stewart birds opt for an Ameraucana, they lay Easter egg colors! Now this is more like it! 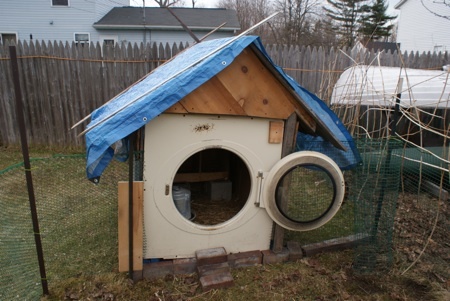 A chicken mansion, the birds may be living better than the homeowners! So why should you have a quaint little home for your chickies? Happy chickens that are kept warm and fed well produce these for you to eat! Now I don’t know a thing about farming. But I do know a thing or two about bribery, and begging. And it just so happens that I am in good with a farmer goat who lives in Montana, and her name is Pricilla. She’s ornery and very full of herself, and I will probaby want to strangle her, I mean hug her, but don’t put it past me to pay her off with some tasty spinach, carrots and apples to learn a thing or two about farming! What are your thoughts about chickens? Love em’ or hate em? You know I will help you as much as I can but I will warn you about stinkin’ chickens….they POOP everywhere. And I do mean everywhere so those beautiful coops you have pictured – they will stay beautiful for all of about 2 hours. Then they will be covered with poop. Unless you want to be out there shoveling said poop on a regular basis.